The New Year, New You Pledge has ended. Check out BrothersAllNatural.com for current promotions. Chips are high in fat and calories, which can raise the risk of weight gain and obesity. One ounce of plain potato chips (about 17 chips) contains about 10 grams of fat and 154 calories. The sodium content in chips may negatively impact your cardiovascular health. A high intake of sodium can cause an increase in blood pressure, which can lead to stroke, heart failure, coronary heart disease, kidney disease and premature death. 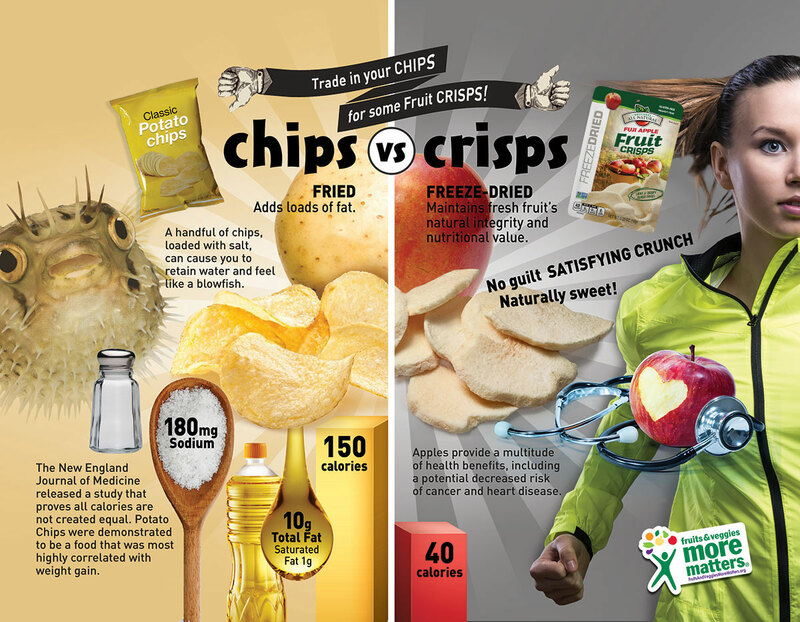 Chip consumption can contribute to high cholesterol levels because of the amount and type of fat found in chips. Most chips are deep-fried, a process that creates trans fats, the most dangerous type. In addition, the oils used for frying chips are often saturated fats, which also contribute to high cholesterol levels. High cholesterol is one of the leading causes of heart disease today. Fruit Crisps Are The Healthier Choice! Brothers All Natural Fruit Crisps are fat free and low in calories. One bag of our Apple Fruit Crisps contains 0 grams of fat and only 40 calories, each bag provides 2 servings of fruit. Brothers All Natural Fruit Crisps contain no sodium. Low sodium diets have shown to lower blood pressure and reduce hypertension. This means that you will lower the risks of high blood pressure, stroke, heart failure, kidney disease and premature death by eliminating salty foods from your diet. Cutting salt out of your diet can lead to a healthy lifestyle, weight loss, and more energy.